Like his always bustling Flour + Water corner restaurant in San Francisco's Mission district, chef/owner McNaughton's latest offering is a gem. The first section, "Dough," gives home cooks everything they need to know about making, cooking, and serving fresh pasta and is followed by the recipes. Divided by season, the 50 recipes will challenge and delight readers with selections such as zucchini tortellini with chicken cracklings; pappardelle with braised turkey legs; and lemon farfalle with spring pea ragu. Well written headnotes go over unique recipes, such as beet casonsei (fan-like folded pasta from the Alps) with poppy seeds and the house-made Flour + Water pork sausage. 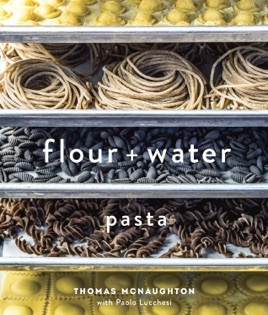 The author's passion for pasta shines through and thoughtful instructions, along with how-to photographs, will inspire even amateur cooks to get flour on their hands.